We asked an array of people — hiring editors, recent graduates, professors, technologists, deans — to evaluate the job j-schools are doing and to offer ideas for how they might improve. Over the coming days, we’ll be sharing their thoughts with you. Here’s Steve Buttry, digital transformation editor for Digital First Media. Students live digital-first lives. Student media need to become digital-first. They should consider and experiment with new approaches even more vigorously and daringly than professional media. But student journalists working for campus newspapers quickly mimic their elders’ fondness for working for a print product. The rush of seeing your byline in print crosses generational divides. At two recent workshops, I showed student journalists in Texas why their student media are becoming digital-first. On a whiteboard in one workshop and a flip-chart sheet in the other, I drew four columns: print, broadcast, computer, and mobile. I asked the students to tell me what media bring them their information about the world beyond friends, family, and faculty, placing each student’s percentages for each type of media in the four columns. Student journalists from the University of Texas-Arlington and Texas Christian University filled them in about the same: One would say 60 percent computer, 20 percent mobile, and 10 percent each print and broadcast; the next would say 60 percent mobile, 30 percent computer, 10 percent broadcast, 0 percentprint. The columns filled up with large numbers in the digital columns, small ones in the legacy columns. The only TCU student who put 0 in the mobile column felt obliged to explain that she had a crappy old phone. No one felt a need to explain zeros in print or broadcast. These were numbers for students who were considering careers in print and broadcast media, I noted to them. The numbers would be even more skewed toward digital for their peers who had never labored to put out a newspaper, never clipped out a story bearing their byline. On an April consulting visit to TCU, I wandered one evening to a few campus buildings and saw stacks of that morning’s Daily Skiff unclaimed in several distribution racks. Earlier in the semester, when Fort Worth police arrested 16 students in a drug bust, coverage by TCU360.com brought 100,000 pageviews. This year, I have consulted or trained with student media at UTA, TCU, and the University of Oregon on their conversion to digital-first operations. I’ll be training this fall at the University of Colorado, where student media are digital-only. I presume that other student media are making similar moves, but too many remain focused on publishing a daily newspaper and/or planning a daily broadcast, with the website in a secondary position. In that way, they are like too many professional media. I have worked in professional print and broadcast operations where the tasks and culture of legacy media thwarted efforts at digital innovation. That’s unfortunate and damaging in professional news operations, where the audience and revenue streams from the legacy media provide some cover for resistance to change. But student media can find a prosperous future themselves as they show professional media how to make this difficult transition. Some student media, such as those at UTA and TCU, receive funding from non-market sources, such as subsidies from student fees or university budgets. Student media don’t have the high wage and salary structures of professional media. Staff members move on naturally, so restructuring between semesters or school years is easier. Student media shut down or slow down for summer and holiday breaks, giving convenient times for making huge changes. 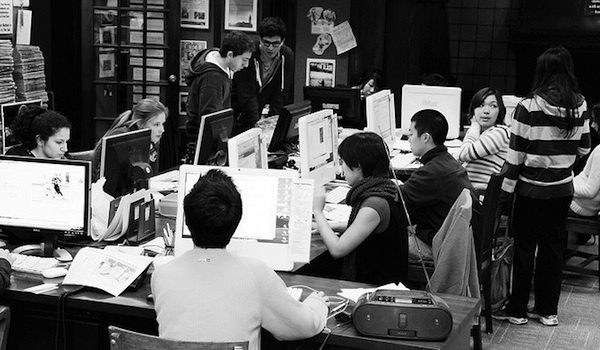 Student media generally don’t have their own printing operations and their related costs. If advertisers in student media want to reach the student audience, they should embrace the opportunity to advertise in student products geared for the digital audience, where students spend more time. If advertisers just want to support the student venture, they can do that as effectively on digital media (and student sales reps can also sell the feel-good value of helping student media develop a successful model for the future). A weekly or twice-weekly product can serve advertisers insistent on being in print. Oregon’s Emerald Media and UTA’s Shorthorn have cut their print frequency to bi-weekly and weekly, respectively. This forces a digital approach to daily news coverage and a rethinking of what the print product should be. The University of Georgia’s Red and Black took a similar move last year, though that experiment has been overshadowed recently by upheaval over the control and independence of the operation. TCU is continuing its daily (Tuesday through Friday) print edition of the Skiff and weekly TCU News Now cable broadcast (with shorter daily updates). But one content team will produce all content first for TCU360, the student digital news operation launched last year. Print editors and news directors produce the newspaper and newscast from the digital content. TCU has also launched a web-only off-campus community-focused news operation, the109, covering the 76109 ZIP code, neighboring the campus. I’m sure (and I hope) that other student newsrooms are experimenting this year with digital-first approaches. On campuses everywhere, students have made the news-consumption transition swiftly, learning about their world on smartphones, tablets and laptop computers. The choice for student media is simple: Slide into irrelevancy even faster than professional media that fail to adapt, or race into the digital future and help show them the way. Image from Matt Hintsa used under a Creative Commons license. Buttry, Steve. "Steve Buttry: Students already consume news digital-first; student media should follow suit." Nieman Journalism Lab. Nieman Foundation for Journalism at Harvard, 19 Sep. 2012. Web. 19 Apr. 2019. Buttry, Steve. "Steve Buttry: Students already consume news digital-first; student media should follow suit." Nieman Journalism Lab. Last modified September 19, 2012. Accessed April 19, 2019. https://www.niemanlab.org/2012/09/steve-buttry-students-already-consume-news-digital-first-student-media-should-follow-suit/.